Between increased use of server virtualization, the dynamic proliferation of private cloud, the ever-growing unstructured data pool, and the advent of “big data,” organizational data is going to continue to grow. Effective deduplication reduces the impact of that growth, lessening the strain of constant storage growth on organizations. Choosing a deduplication strategy involves assessing a range of factors such as data type and location. 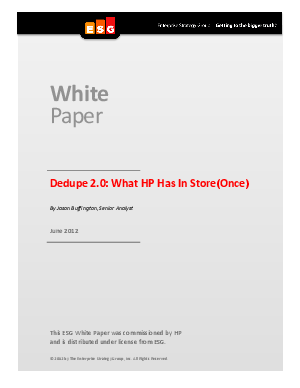 By being able to support deduplication at the data source, backup server, and appliance, HP StoreOnce gives data protection solution architects a high degree of flexibility in developing a deduplication strategy and solution tailored to their needs.